Introduction The Gaps-in-Noise (GIN) test assesses the hearing ability of temporal resolution. The development of this ability can be considered essential for learning how to read. Objective Identify temporal resolution in individuals diagnosed with reading and writing disorders compared with subjects with dyslexia. Methods A sample of 26 subjects of both genders, age 10 to 15 years, included 11 diagnosed with dyslexia and 15 diagnosed with reading and writing disorders. Subjects did not display otologic, neurologic, and/or cognitive diseases. A control group of 30 normal-hearing subjects was formed to compare thresholds and percentages obtained from the GIN test. The responses were obtained considering two measures of analysis: the threshold gap and the percentage of correct gap. Results The threshold was lower in the GIN for the typical group than for the other groups. There was no difference between groups with dyslexia and with reading and writing disorders. The GIN results of the typical group revealed a higher percentage of correct answer than in the other groups. No difference was obtained between the groups with dyslexia and with reading and writing disorders. 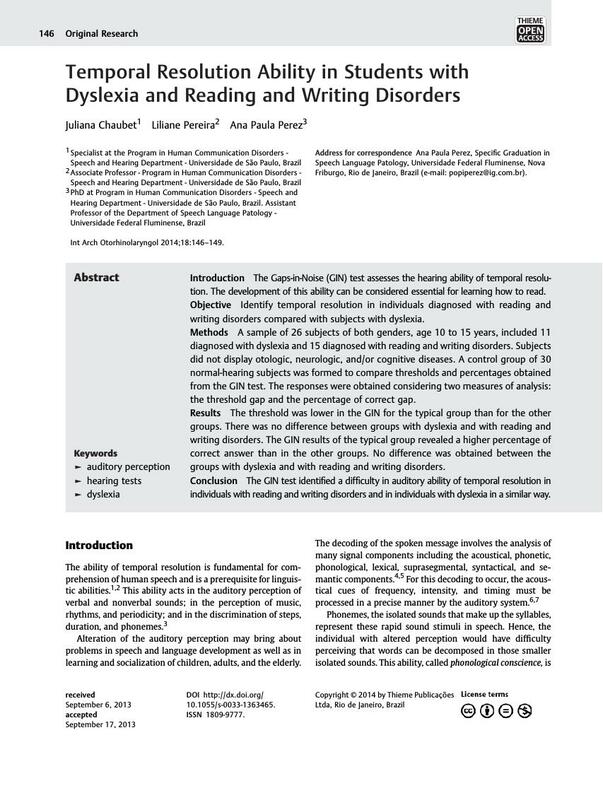 Conclusion The GIN test identified a difficulty in auditory ability of temporal resolution in individuals with reading and writing disorders and in individuals with dyslexia in a similar way.